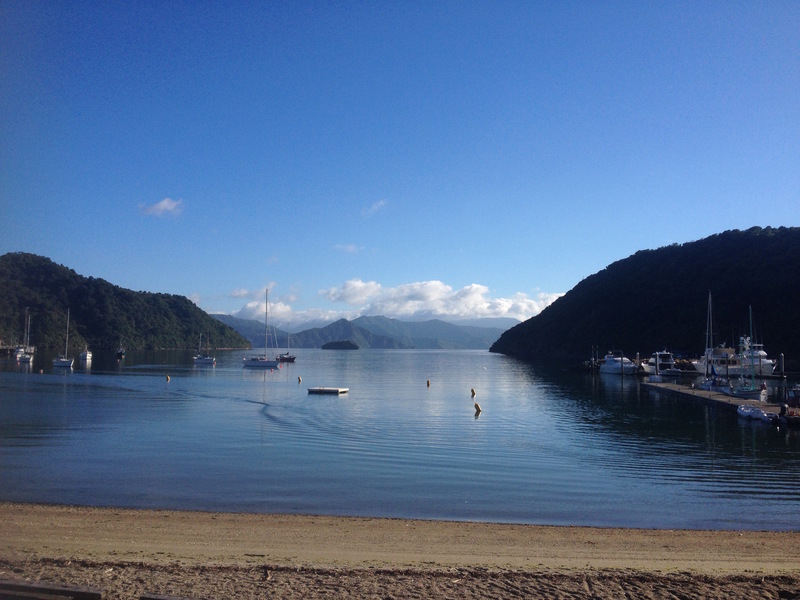 The journey on to Picton felt like a race against the clock, we stopped overnight along the way, before driving on to make the ferry on time. Along the way into town the clouds enveloped mountains. Fog rested at their feet. The silhouettes of trees stood out on exposed ridge lines. The sun touched everything it’s domain. We were on the road in the golden hour of the morning as the valley came to life. It’s all too easy to draw comparisons to places closer to home. The valleys of Wales, the glens of Scotland, the greens of Ireland. What are the chances I’ll go there and see it at it’s absolute best? It’s not always about the distance travelled, sometimes it’s just about being there in the moment. I ,for one, was glad to have made the trip. 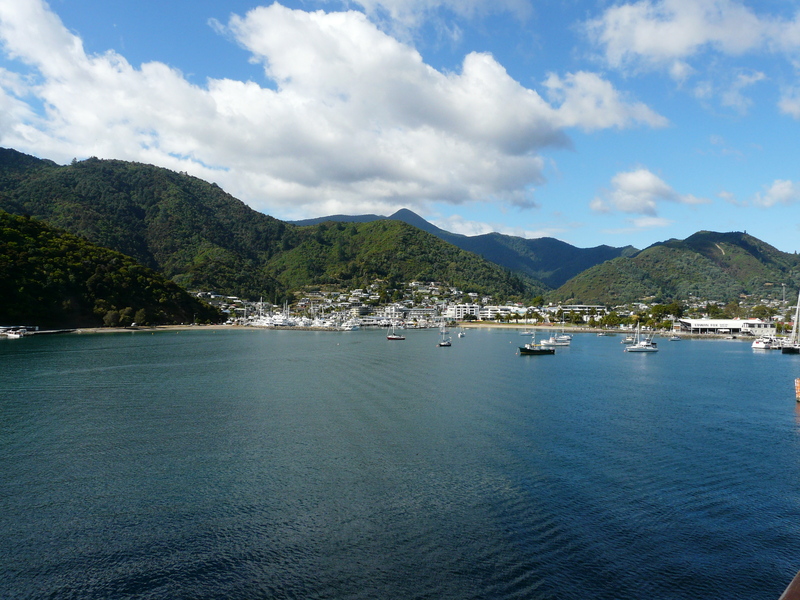 We raced into Picton well ahead of schedule to catch the ferry across the Cook Strait. We waited on the waterfront for almost an hour before we were able to join the queue of cars and camper vans for another hour. We boarded in good time and found seats towards the middle of the ferry. The pastel greys, browns and greens, filled with bored passengers, it could have just as easily been a dentist’s waiting room. 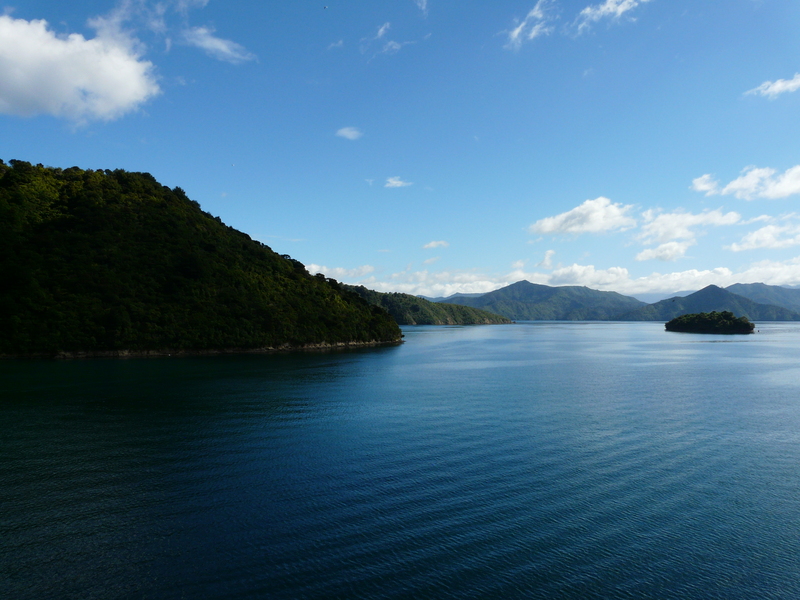 We walked out to the bow to watch the ferry glide through Queen Charlotte Sound towards the open waters between New Zealand’s north and south islands. The boat turned much to my surprise, I assumed we’d head directly north but the journey took us east. The mountains finally gave up behind us and we were in the Cook Straight before they started up again with the north island coming into view. The crossing passed quickly and we were back in the van. 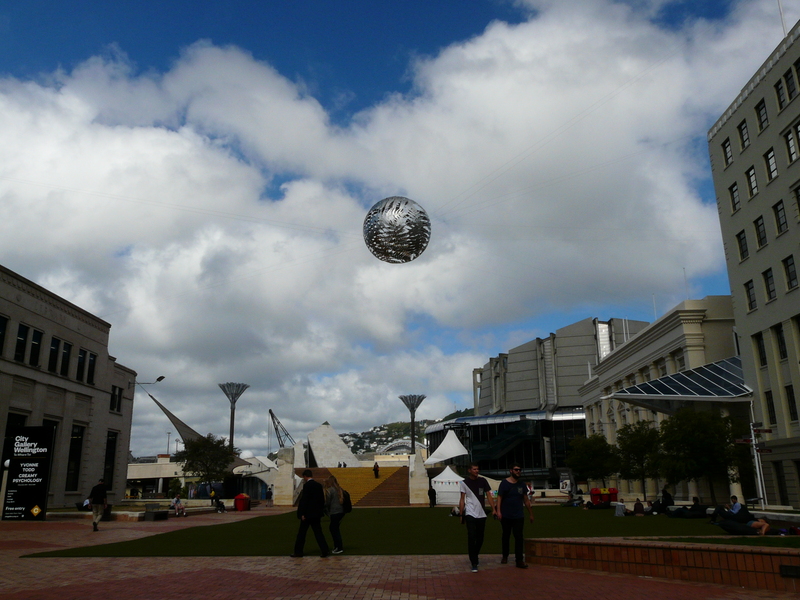 Jason left us in Wellington, we were going to do a little sight seeing before heading to his home further north. The Museum of New Zealand seemed an obvious choice of destination. We could get an education you know, come away a better understanding of our surroundings and the culture of the country, that sort of thing. I’ve been spoiled by museums and I find myself with exceptionally high standards, the Museum of New Zealand did not deliver the goods. There was no order, no structure. One minute I was looking at the ancient shiftings of tectonic plates, the next I was reading about the British acquisition of lands from the Maori. None of the exhibits seemed to have much founding in known truths, there were a lot of quotes from people who thoughts this, or considered that. It seems there’s no real agreement on when New Zealand was first inhabited by people. What can be agreed upon is when ever they did first make land, and continued to arrive, they brought lots of unpleasant invasive creatures with them to systematically destroy the natives. Lisa and Dad started off together, I figured they’d get through the museum in little more than 20 minutes and go find something else to do. Mum was just behind me to begin with and then she disappeared. Did I move too quickly for her? I carried on browsing the few things that caught my interest, wondering whether or not I’d find the others soon so we could go and do something else in the city. The Garage Project Brewery was nearby and I had started to think time would be better spent sampling some of their finest work. I finished up with the museum to find Lisa and Dad browsing the gift shop. No surprises there then. They’d called it a day not long before me. None of us had seen Mum, we figured she had to be behind us. She was more like me and would want to get a good fill of knowledge while she was here, so we thought. Dad and I waited near the entrance, what we thought would be the obvious place to wait. I kept one eye on the clock as closing time drew ever nearer. Should we go back in and look for her? Maybe she had walked past us and we’ve missed her. Lisa had to do some shopping in town, she’d been and gone before we found Mum. Lisa went back to the van and found a note on the dashboard. It looked like Mum had decided we’d all abandoned her and went off on her own little adventure beyond the walls of the museum. Dad and I had wasted our time waiting for someone who had already gone and left! We thought we were doing the right thing, we assumed this is what we would all do if we became separated. Except Mum, she thought she’d just wander off and see what was happening in the local area. We could have gone for a bloody beer! There was no time now, we had to head off to Jason’s. Leaving the city was perhaps one of the trickier drives since Lisa and Dad had managed to get us lost outside of Christchurch. At the time, I was laying the blame on Lisa, she was navigating so it was up to her to make sure we took the correct turns. What I hadn’t counted on was Dad’s consistent ability to ignore his navigator and do whatever he pleased. We eventually made it on to the correct highway out of the city after a couple of lefts that were meant to be rights. We arrived at Jason’s early in the evening and met his family. Dad had done a lot of work for Jason over the years when he lived in the UK. I don’t often think of my Dad having friends. He’s always just gone to work or sat at home watching old murder mysteries on the T.V. Of course, there were things I’d forget. He used to go out on an occasional evening to the pub with Jason and their mutual friend Steve, They’d get steaming drunk, have a royal good time and stumble home in the early hours. They’ve often come canoeing with us on the Thames at home. They laughed and joked, abused each other and just seemed to enjoy being together. I was seeing my Dad as somebody’s friend for the first time. We were fed, watered, given separate rooms for the first time in a couple of weeks and were happy to have a little bit of space from one another.